Missouri's budget for the current fiscal year is being cut again. Gov. Jay Nixon announced Wednesday that he's withholding $51 million from the FY2017 budget, which runs through June 30 of next year. The vast bulk of the temporary cut is coming out of Medicaid. He said, though, that one of the reasons he's withholding $42.8 million from Medicaid programs is positive: cost savings enacted by his administration. "In my time as governor, we've work hard to increase efficiency in managed costs in (the) Medicaid program, and we will continue to do so this year." Nixon told reporters that while Medicaid and similar costs will continue to grow, they're expected to grow at a slower pace than a year ago at this time. "Some of the supplemental budget requests are far under what those numbers were last year. (The) most recent numbers we're looking at for potential supplemental (Medicaid budget) is only about $54 million, compared to about $278 million last year," he said. "We are in a process where our management of the Medicaid program is yielding direct benefits. We fully expect (the) supplemental (budget) to be nowhere near (the) necessary level that it was last year." Gov. 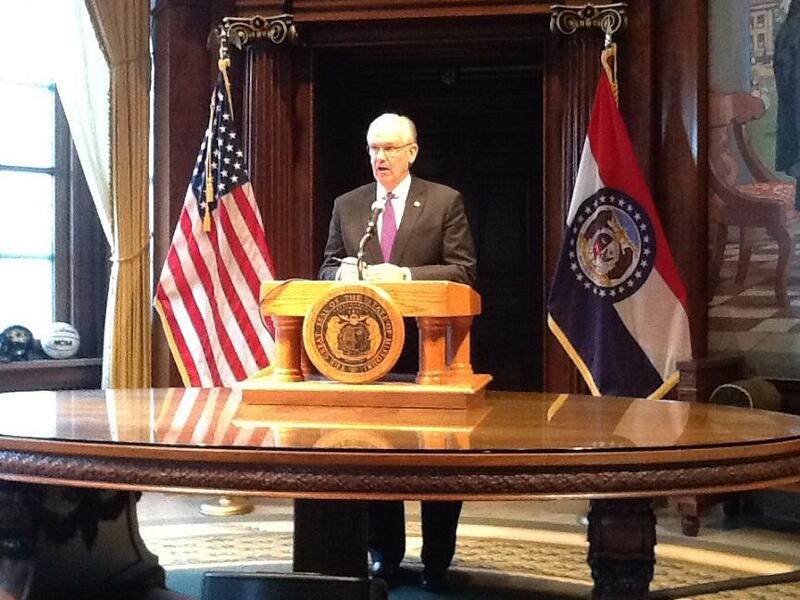 Jay Nixon announces he's withholding $51 million from the current state budget. Nixon said a drop in corporate tax collections made the temporary Medicaid cuts necessary, and he blamed that on loopholes created by the Republican-controlled legislature. Acting budget director Dan Haug told St. Louis Public Radio's Jo Mannies that corporate tax collections are down by more than 35 percent in less than two years. He blames the drop on a change in Missouri's tax laws that deal with how multi-state corporations divide profits among the states where they do business. For years, Nixon and fellow Democrats in the legislature have called on Republican leaders to expand Medicaid, which is a key component of President Obama's Affordable Care Act. Although the U.S. Supreme Court upheld Obamacare, it struck down language that required all 50 states to expand Medicaid. As a result, Missouri and several other states have refused to expand, creating a coverage gap in which many low-income residents can't afford to purchase health insurance but still make too much money to qualify for Medicaid. In addition to the Medicaid restriction, Nixon is withholding $8.8 million from the state's bonding authority, which is used to maintain buildings. He downplayed any adverse effect that might have on capital improvement projects. "Because of our strong fiscal management (and) our spotless AAA credit rating, we're going to save taxpayers $8.8 million while continuing to make these historic investments and have less bonded indebtedness when I graduate as governor than we came in," he said. "When you get the good interest rates, we're not going to have to make (a higher) level of payment." Since July 1, Nixon has withheld a total of $201 million from the current state budget, although he's released various amounts since then, including $8.7 million in late October following the settlement of Missouri's lawsuit against Volkswagen over deceptive emission monitoring. Nixon even bragged a bit to reporters that he's withheld more than $2.2 billion from the state budget since taking office in 2009, and said it was necessary due to attempts by Republicans to overspend. "Their job is not to balance the budget; their job is to provide spending authority, which is born out by the fact that they have not balanced budgets," he said. "If I don't show great deference to the overspending legislature's view as to what is the proper way to fiscally manage a state, so be it." As for whether the incoming governor, Eric Greitens, would have to make any temporary spending cuts, "that's up to him." Weeks before the new Missouri governor is about to take office, he’s faced with a state-government budget shortfall that requires immediate cuts of several hundred million dollars. But the governor-elect in question isn’t Republican Eric Greitens, who will be sworn in Jan. 9 amid concern over a current state budget that may need trims of $200 million. The governor-elect with the much larger budget headache was Democrat Jay Nixon in January 2009, as he prepared to become Missouri’s new governor. As noted last week, Gov.-elect Eric Greitens will have a lot of latitude to bring about major policy changes – thanks to huge Republican majorities in the General Assembly. But it’s becoming abundantly clear that Greitens will encounter more than just the glory of legislative accomplishment when he’s sworn in next year. That’s because both Republican and Democratic lawmakers on the House Budget Committee believe Greitens will have to dive into the not-so-fun task of withholding tens of millions of dollars from Missouri’s budget. It will be first big governmental test for Greitens, who has no elected experience. Because Missouri has so far opted out of Medicaid expansion under the Affordable Care Act, thousands of Missourians fall into a gap -- they make too much money to qualify for Medicaid, but not enough to qualify for federal aid on the healthcare exchange. State legislators have made it clear that expansion is unlikely to happen this year either. But Medicaid advocate Richard von Glahn remains optimistic.